Home → Opinion → What has Pharmacy got to do with the riots? Is Inner city planning (or gentrification) the issue? On the level of penalty: Should the crime get extra penalty because you did it during a riot or should it get less of a penalty because everyone might be tempted to do it like everyone else? 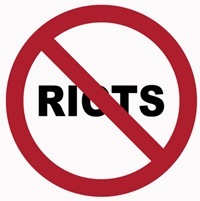 What has been refreshing in the series of debates on the riots, has been the rational and measured way in which it has been conducted. I have no doubt that the problem is multi-factorial and rational attempt to unpick these issues are necessary. The riot is a senseless charade which I echoed in my previous post. There is a role for stiff penalties for those who show a clear lack of remorse for the damages caused. There will be others who, in the cold light of day, realise the absurdity of their action and are genuinely remorseful. They should have the opportunity to have a degree of restorative justice. In all of these, what has Pharmacy got to do with it? Clearly some pharmacies were targeted by the rioters but that is not why I am posting this. In July, I eluded to a vote to allow Pharmaceutical Scientists membership of the Royal Pharmaceutical Society (13) – guess what? Members voted Yes to the special resolution. In 2008, I described a lack of self-belief in our role as community pharmacists (in particular) and pharmacists (in general) (14). One of the reasons I proposed for this perception was that we are pharmacists because we failed in our bid to get into medical school. This is a reality for some who studied pharmacy but not necessarily so for others. Pharmacy is an important profession with a different sphere of expertise to say: medical profession. In any case those who eventually studied pharmacy (but not their first choice) are developing satisfactory careers in the profession of pharmacy. That lack of self-belief should not be there. In any case some of the barriers to self-confidence and self-determination are being removed. The same arguments apply to some of our pharmaceutical scientist colleagues. Some, not all, have ended up studying pharmaceutical sciences because, for whatever reasons, they couldn’t study pharmacy. With this move, the Pharmacy profession, is saying that it understands these barriers and is determined to break them down. By allowing pharmaceutical scientist to join the fold, it is recognising its science base and expressing a wish to work with pharmaceutical scientists who are committed to advancing the pharmaceutical needs of their patients. It also want to promote aspiration amongst its pharmaceutical scientist colleagues and break this cycle of lack of self belief. One of the many reasons attributed to these riots is the lack of aspiration in a class or cohort of the society. It is becoming clear to me that by its actions, my profession (in a small way) is doing its bit to contribute to the aspiration debate whereby hard work, diligence and dedication to what matters is rewarded at the highest levels. We therefore remain a profession of aspiration. It is moves like this that is changing our social fabric and will undoubtedly have significant impact on aspiration in years to come. If these real changes are happening, then the onus is on individuals (with help of government), to exploit opportunities and not accept a defeated and defeatist attitude to their special sets of circumstances. Breaking the law in such grotesque manner does not pay. There is another way! The question is: are you ready or willing to choose it?